Today I’m sharing about a new skincare product that I’ve been using and enjoying; a facial bar to be exact! 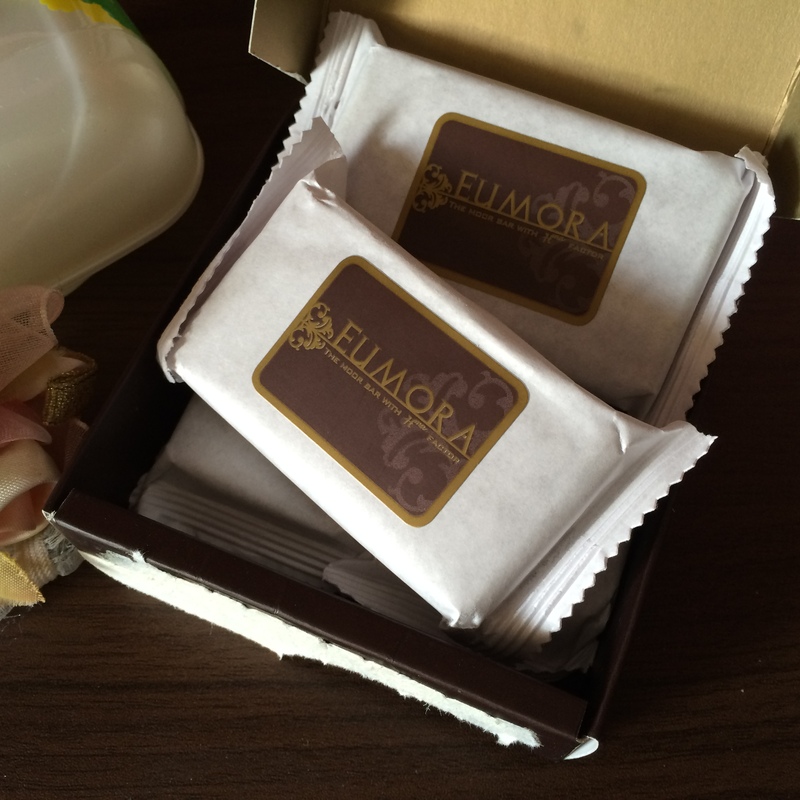 My Eumora bars came in an elegant Europe-style box with baroque print details, lovely isn’t it? 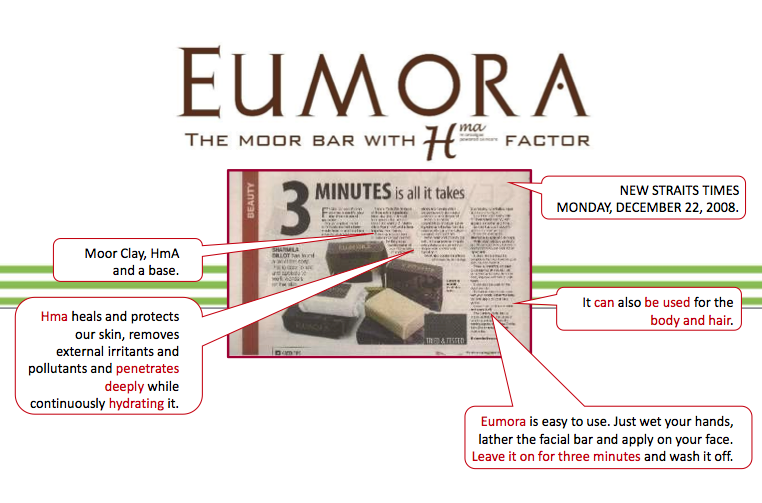 Close up of the box; Eumora The Moor Bar with Hma Factor. Bare face, cleansed and no that is not my facial oil shine on my nose and forehead… it’s a legit and visible shine every time after I use the bar! No photoshop or filter for this pic either! When I started using the facial bar, I was very impressed with the shine on my face after cleansing, I would look at my face in the mirror and go “wow”, this stuff is really hydrating! So in addition to the cleansing and hydration effect of this facial bar, what I like is that it gently cleanses without any taut feeling after, so I know that it doesn’t strip my face off the necessary oil. In case you don’t know, if we strip our face of the good oils, it will cause our skin to churn out more oil. So to gently cleanse your face without stripping it completely off oil is better for your skin in the long run! 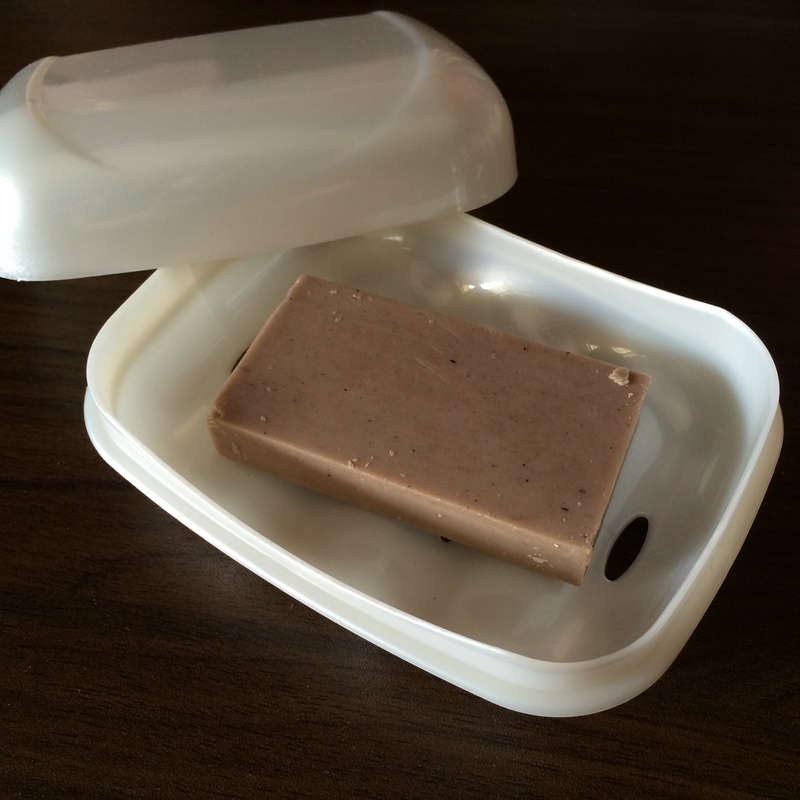 The facial bar is fragrance free. To use, you will have to wash your hands, lather the soap bar in your hands and then spread and leave the lather on your face for 3 minutes before washing it off with water after. A note of caution, you might experience a healing crisis, as in a breakout after using this product as it helps you to expel the toxins in the body. So don’t worry and it is normal. So just what goes into this facial bar that makes it hydrating and unique as I mentioned? Moor has been used for well being for at least 2,000 years. even Cleopatra was reputed to have indulged in Moor as part of her beauty regimen. Wow! Sounds impressive isn’t it? In case you think Cleopatra is merely a Shakespearean character ala in Anthony & Cleopatra, she really did exist. 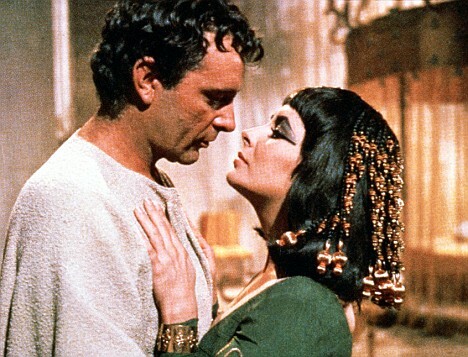 A cinematic portrayal of Anthony & Cleopatra. Cleopatra VII Philopator (Greek: Κλεοπάτρα Φιλοπάτωρ; Late 69 BC – August 12, 30 BC), known to history as Cleopatra, was the last active pharaoh of Ancient Egypt, only shortly survived by her son, Caesarion as pharaoh. The name Cleopatra is derived from the Greek name Κλεοπατρα (Kleopatra) which meant “glory of the father” in the feminine form, derived from κλεος (kleos) “glory” combined with πατρος (patros) “of the father” (the masculine form would be Kleopatros Κλεοπατρος).. – Wikipedia. 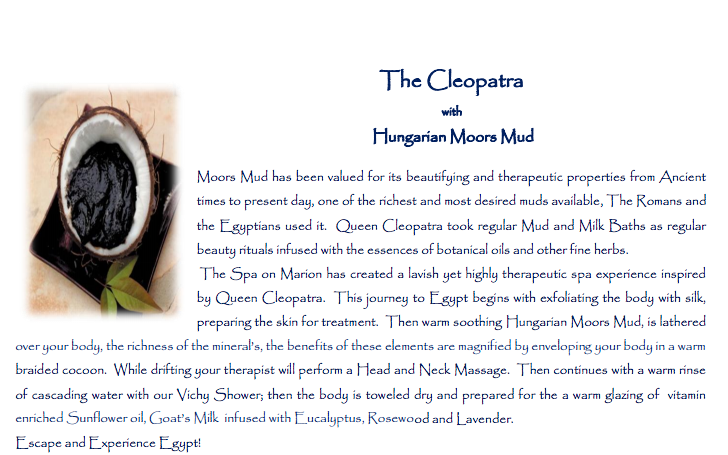 According to this Spa shop, Queen Cleopatra took regular Mud and Milk Baths as her beauty ritual! Moor mud is an organic peat substance formed by the decomposition of a variety of plants over a very long period of time. Extracted from the moorlands of Central Europe, it is a black paste that dissolves easily in water and has a high concentration of amino acids, minerals, plant hormones and vitamins. This mud has been valued for its beautifying and therapeutic properties from ancient times to the present day. It was used by the Romans and the Egyptians; Queen Cleopatra apparently took regular mud dips when she wasn’t bathing in milk. In modern times, people can avail themselves of this mud in spas and health centers, or purchase it for home use from health stores and online health therapy sites. The unique healing properties of this mud have been used to treat a variety of human and animal ailments. The mud has been found to relieve suffering associated with arthritis and rheumatism, soothe muscle aches and reduce joint swellings, and stimulate the immune system. Being an antibiotic and astringent, the mud has a cleansing effect on skin and is used in skin care as a facial or an entire body pack. 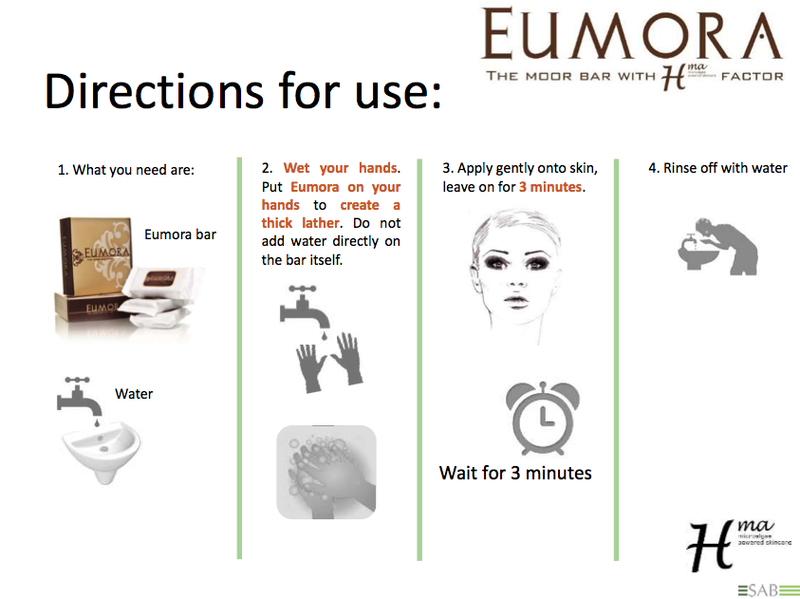 Moor mud treatment improves circulation, staves off wrinkles and gives the skin a healthy glow. It is often used to treat skin problems like acne, eczema andpsoriasiso. Ok, so this Moor Mud thing is legit good for the skin and has healing properties, whether or not Cleopatra was so famously known to have used it in her beauty rituals. Rich in Vitamin B1, B2, B12 and niacin which can increase the skin’s energy and protect the skin to stay away from all kinds of pressure (I think it means the radicals/pollutants in the air). Strengthens defense qualities of the skin barrier. 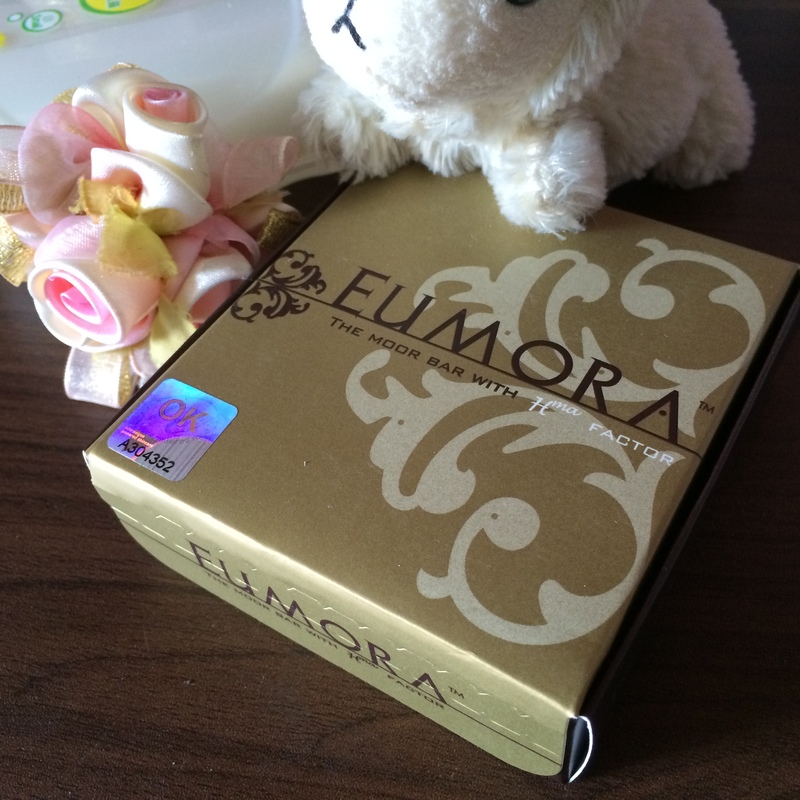 Gives extraordinary softness and brightness. Also reviewed by New Straits Times Paper journalist! 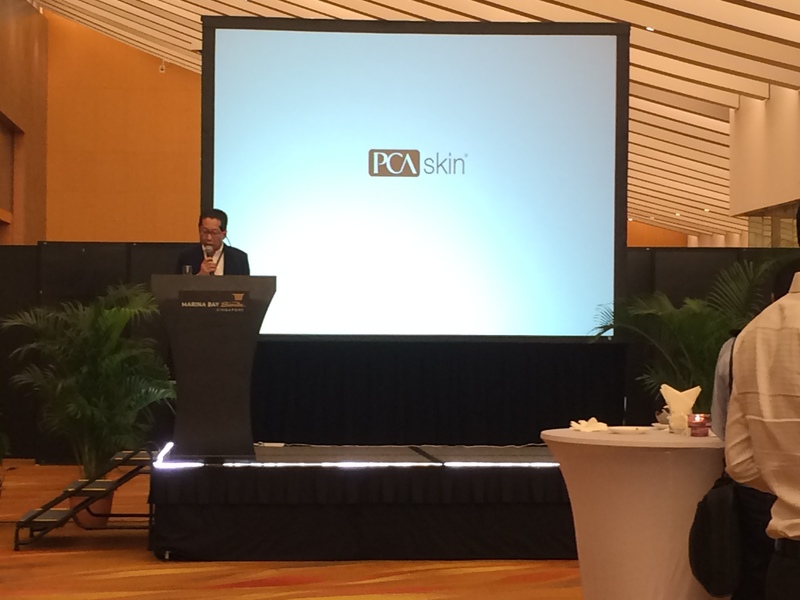 A while back I was invited to attend the launch of PCA Smart Skin Solutions at Marina Bay Sands ballroom. 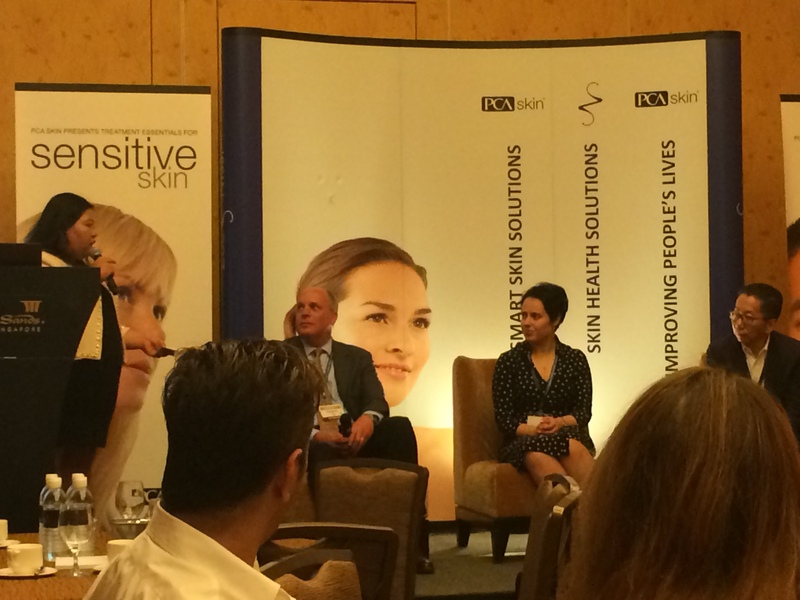 Here we are at the panel of discussion by L-R: Douglas Abel, CEO of PCA Skin, Ivana S. Veljkovi, R&D Manager of PCA Skin and CEO of Zoë Nissi Pte Ltd, PCA Skin’s exclusive distributor in Indonesia, Malaysia, Thailand and Singapore. Zoë Nissi Pte Ltd is a Singapore based company and dedicated in distributing quality and innovative physicians dispensed skin health products. Yes, it means that the skincare products distributed by Zoe Nissi are only available at doctor’s clinics and not available over the counter. More details of where to locate these clinics at the end of the post. After the panel of discussion, we headed over to the launch area where we attended an introduction of the PCA Skin brand and a very thorough talk of Dr Ivana explaining the types of skincare products by PCA Skin. 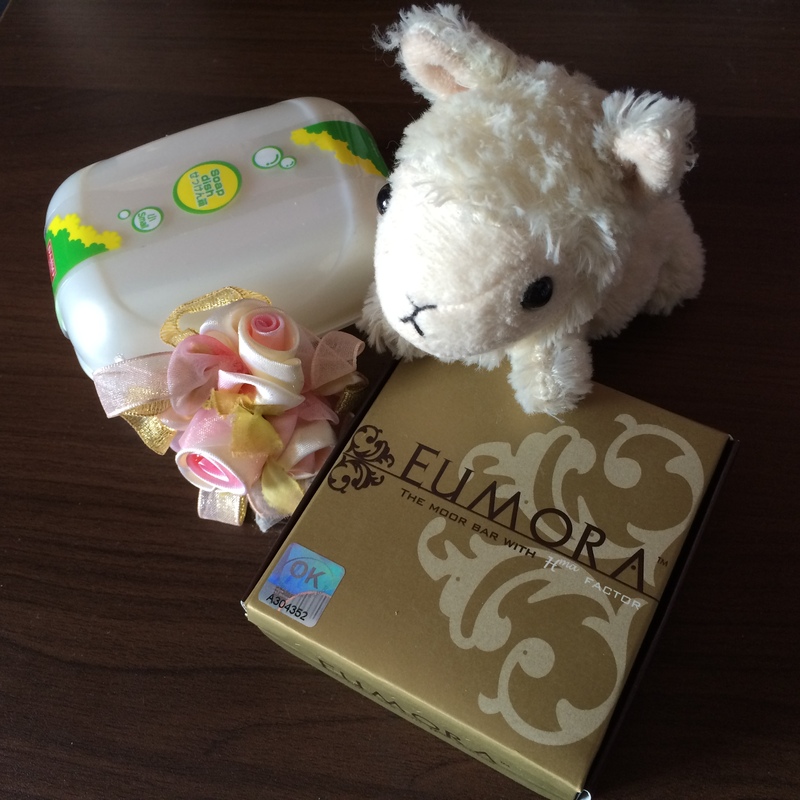 Without further ado, here are the products gifted to the media for review! This gentle latic acid formulation includes a novel cleansing blend that effectively removes environmental impurities and makeup while leaving the skin hydrated, soothed and pH balanced. 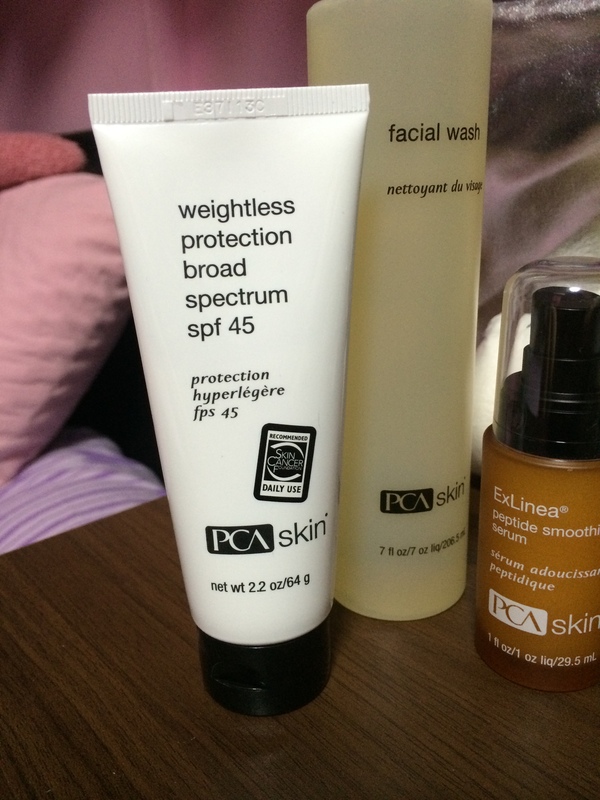 Recommended for normal skin on the face and body. 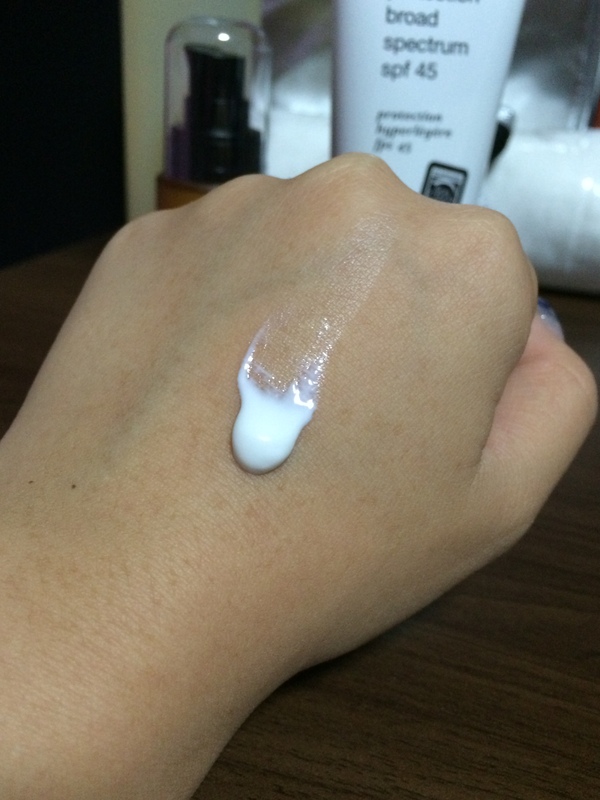 Lactic Acid: a alpha hydroxy acid (AHA) naturally found in milk and sugars, it moisturizes the skin. Aloe Vera Leaf Juice: purifying ingredient best known for its softening and soothing benefits. Directions for use: Apply a dime sized amount to damp skin and massage into a light foaming lather. Rinse with warm water and pat dry. Follow with toner, serums and sunblock in the daytime and moisturiser in the evening. First of all there is a strong traditional chinese medicine scent to this facial wash, which I accrue to the Willow Bark Extract. I have to say that the scent alone would put me off from using this facial foam for the long term, but as the Chinese idiom goes, 良药苦口, bitter medicine is good for health. As the benefits of the willow bark extract calms and soothes the skin. I just really wish that they could have added in some natural fragrant ingredients to mask the scent though. I first lather the facial wash in my hands and then apply and massage all over my skin. It is a gentle wash and it leaves my skin with just a light tinge of tautness. I would recommend this for people who have sensitive skin and require a wash that is gentle, calming, soothing and free from artificial ingredients. This broad spectrum sunscreen provides UVA/UVB protection with the technology of ultra sheer zinc oxide and a blend of additional sunscreen ingredients. It also contains the important antioxidants silybin, also known as milk thistle, and caffaine. Its unique quick absorbing and light finish makes Weightless Protection Broad Spectrum SPF 45 ideal for patients with oily or breakout-prone skin and those who dislike the feel of traditional sunscreen products. Zinc Oxide (0.9%): provides broad spectrum UV protection by reflecting, scattering and absorbing UV rays. Octinoxate (7.5%): absrobs and filters UV rays. Tocopheryl Acetate (Vitamin E): is a fat soluble antioxidant vitamin and emollient ingredient. *Antioxidants protect skin by limiting the production of free radicals, which can damage skin cells. Antioxidants in skin care products can do a lot for the health and appearance of your skin, including reducing the signs of aging. From calming inflamed skin to tightening and toning, antioxidants offer great benefits from natural sources. See more info. here. Directions for use: smooth on skin after cleansing. Allow to absorb 30 minutes prior to daytime exposure. Reapply after two hours of sun exposure and repeat every two hours as needed. It is recommended for daily use. As I am writing this review I realize that I have very strong opinions on the scents for all the 3 products for review. For this sunblock, there is a strong sunblock scent reminiscent of heavy duty Banana Boat types of sunblock. I can’t identify where the scent comes from, but I’m guessing it is one or the combination of active ingredients Zinc Oxide and Octinoxate that gives sunblocks that sunblock scent. So once I smell it, I think of swimming pools and sunny beaches – well, you know the places I go to when I need sunblocks. A little goes a long way. This is how the sunblock looks like. White and semi-liquid. 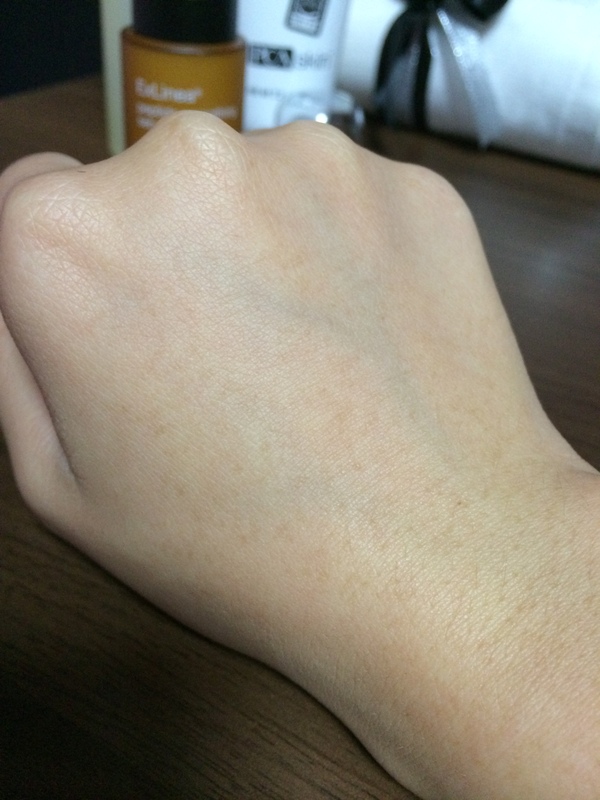 After application, a whitish tinge. After thorough application, it leaves the skin with a white layer, which is super reminiscent of the sunblocks I used to use when I was younger, those days when I go swimming every single day for June holidays! I would recommend this for days when you’re just heading out without make up and of course to the pool or beach where we usually don’t put on make up! On normal days I recommend using this on your hands and legs where its exposed to the sun. 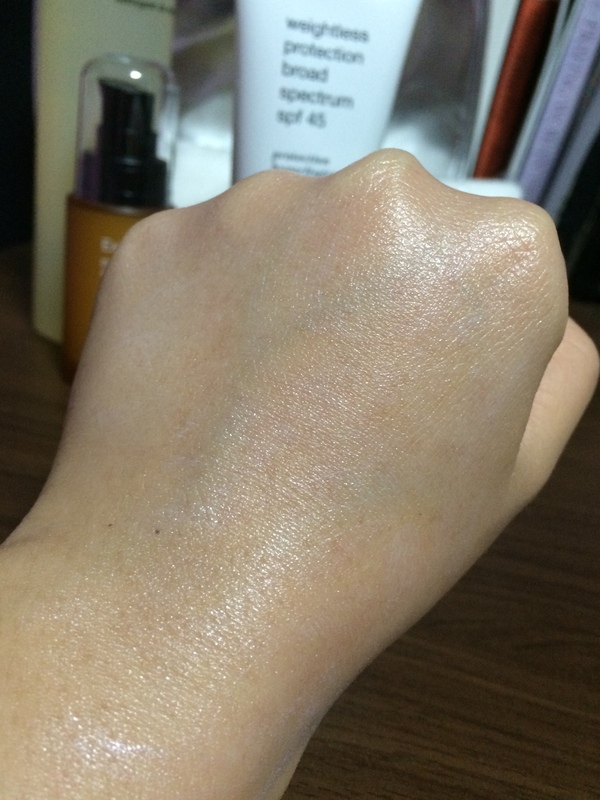 Not so recommended for daily application before make up as it tends to be slightly greasy for its heavy duty nature. Well unless, you know you’re heading out to a sunny place and you need that extra coverage. Then yes, go ahead and protect yourself before the scorching sun dries up the sunblock and your skin! This treatment formulation synergistically hydrates, smoothes and firms aging skin. 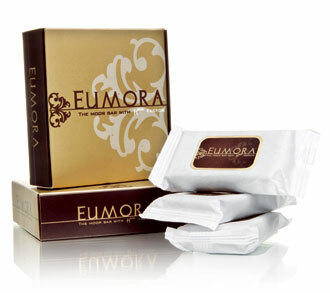 It contains ingredients that minimize the appearance of fine lines and wrinkles. Acetyl Hexapeptide-8 (Argireline) – works to minimize the appearance of fine lines and wrinklling. 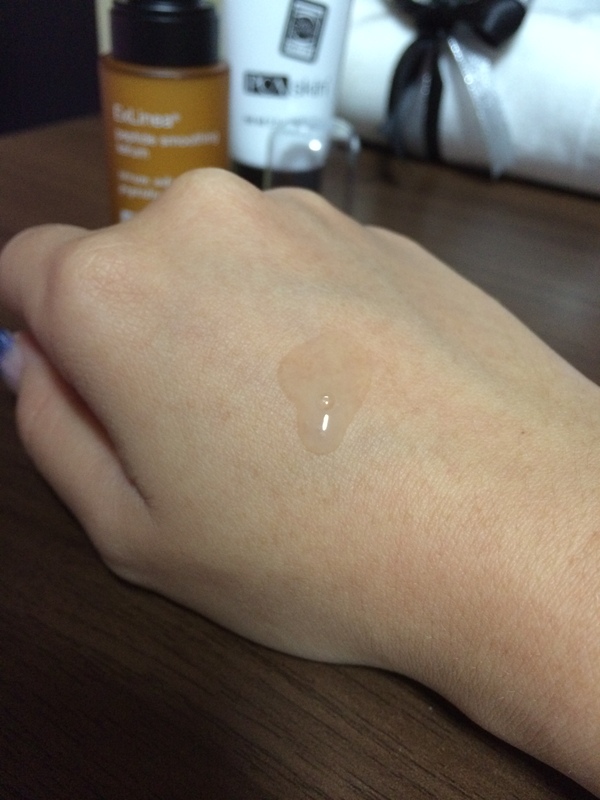 Sodium Hyaluronate – has the ability to hold 1000 times its weight in water; plays an important role in skin hydration. Squalene: is a naturally occurring oil found in such foods as olives and wheat germ. It helps to keep the skin moist. Oryza Sativa (Rice) Bran Wax: helps to moisturize and smooth the skin. Directions for use: after cleansing and toning, smooth one to two pumps onto area of wrinkling and laxity, concentrating on the lines around the eyes, forehead and mouth. No doubt, this is my favourite product of the three. I have been using this for the past week, I love the zesty orange scent and it’s a light liquid, very hydrating and boast of minimizing wrinkles. I have been using it on my forehead and my hands. You’ll see the photos below. I have already been raving about this to my sisters after using it and I am planning to pass to my mum after using it. Lightweight liquid. 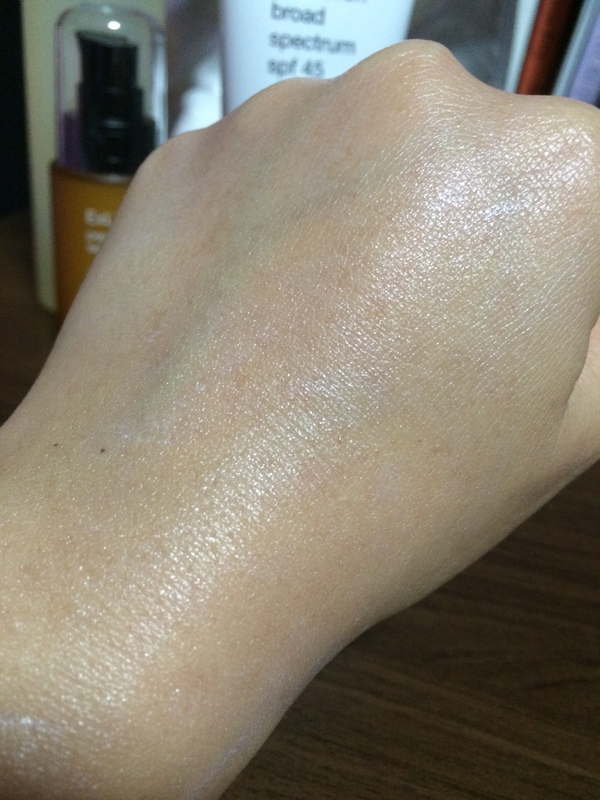 See the difference on my hands before and after application. 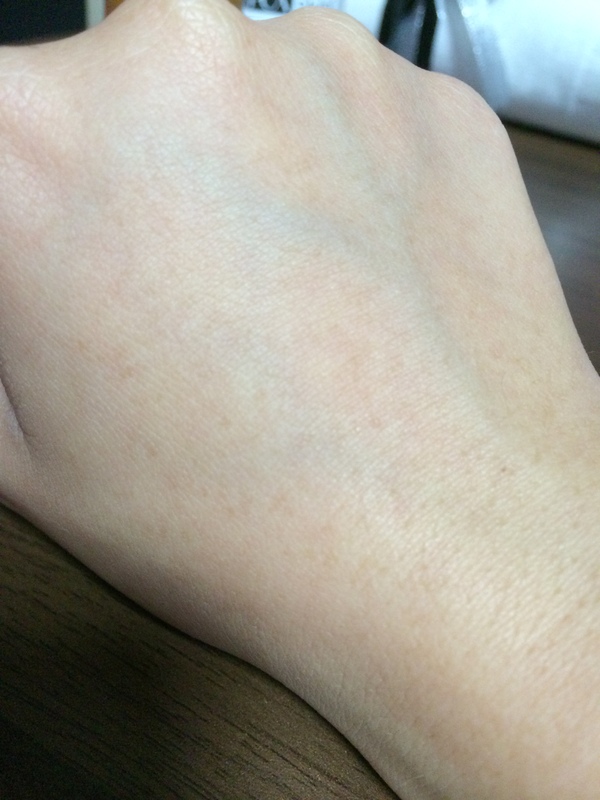 My hand is visibly refreshed and hydrated. Close up to show you that the fine lines are really plumped as promised by the write up! Excellent!!! 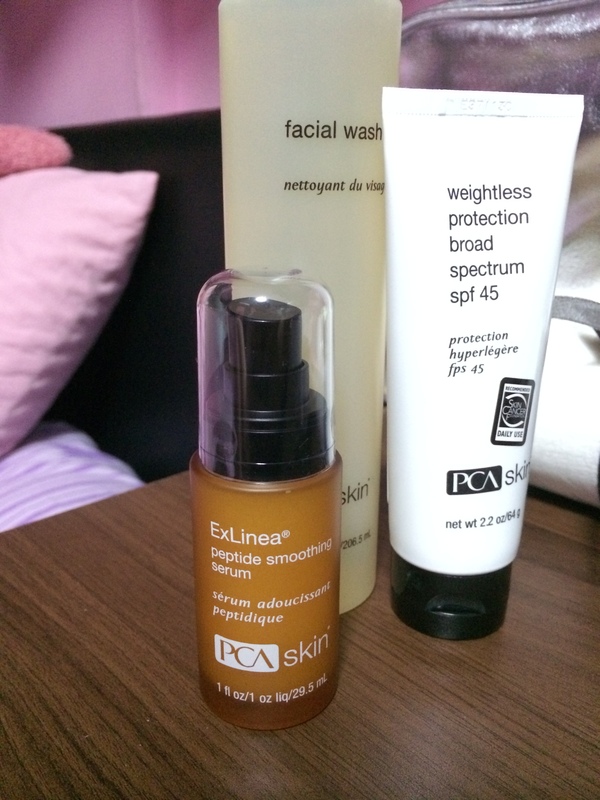 A big thank you to PCA Skin, Zoe Nissi Singapore for the invitation!